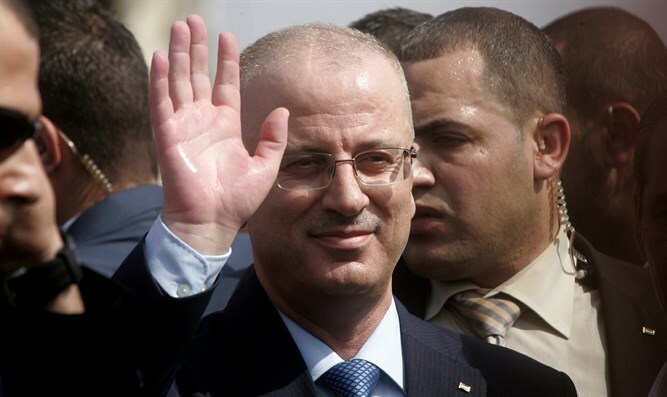 PA premier Rami Hamdallah offers resignation of his cabinet to Mahmoud Abbas. Palestinian Authority premier Rami Hamdallah and his cabinet have resigned, Palestinian Authority media outlets reported Tuesday. Hamdallah submitted a letter to PA chief Mahmoud Abbas Tuesday, announcing the nullification of the current PA cabinet, and his own resignation as premier, WAFA reported. The 60-year-old premier said he hoped to see a new ruling coalition formed “as soon as possible” and would succeed in achieving “national reconciliation” with the Hamas-ruled Gaza Strip. Hamdallah gave no indication, however, that the new government would include either Hamas or other rival terrorist groups, like Islamic Jihad, from the outset. A senior Fatah member, Azzan al-Ahmad, said that the next government in Ramallah would work to isolate Hamas, Haaretz reported. Hamdallah has served as premier since 2013, and is a member of the ruling Fatah faction of the Palestine Liberation Organization.